Shazam! gets off to a needlessly slow and convoluted start; the first half-hour not only introduces the teenage protagonist, Billy Baston (Asher Angel), but provides a full-blown origin story for the resident bad guy, Thaddeus Sivana (Mark Strong), who has daddy issues. Once we are past the getting-to-know-you portion of Shazam!, things pick up considerably. Billy, an orphan (abandoned by the mother he never stops looking for – the quest for her is his raison d’être, although its resolution seems shoehorned in), is in the right place at the right time (or perhaps the wrong place at the wrong time) to be chosen by the Wizard Shazam (Djimon Hounsou) to inherit his six mystical powers: the wisdom of Solomon, the strength of Hercules, the stamina of Atlas, the power of Zeus, the courage of Achilles, and the speed of Mercury. (There doesn’t seem to be much concern about mixing the Greek and Roman gods.) 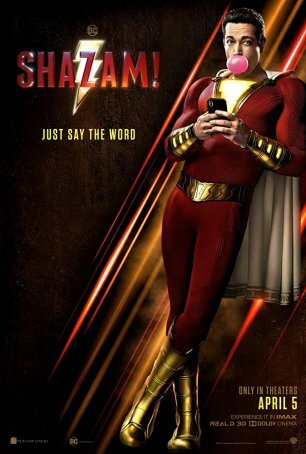 All he has to do is say “Shazam!” to switch back and forth between his 14-year old boy’s body and the buff form of Zachary Levi, who’s a bizarre amalgamation of Lou Ferrigno and John Krasinski. Director David F. Sandberg transforms the obligatory “exploration of superpowers” (mandatory per Superhero Origin Story 101) into the film’s most entertaining sequences. Helped by his geeky foster brother Freddy Freeman (Jack Dylan Grazer), Billy tries to figure out what superpowers he has (flying and laser eyes elude him) and what he can do with them. Because he’s a 14-year old boy, however, he’s less interested in stopping crimes and saving the world than he is in recharging the phones of random passers-by, causing vending machines to discharge large numbers of soda cans, and taking selfies of himself doing amazing things. There are numerous attempts to name him but none of the appellations, which range from Mr. Philadelphia to Mr. Sparkle Fingers, stick. His comic book name, Captain Marvel, isn’t used for obvious reasons. Eventually, Shazam! wanders into generic superhero film territory with the newly-minted hero going up against Big Bad Sivana. The battles between these two, which take place on the streets and in the skies of Philadelphia (or Toronto when acting as a stand-in), feel like a low-rent version of the Superman vs. Zod bout from Superman II, although without the exploding Coca Cola sign. When it comes to the climactic confrontation, there’s no deviation from the formula. Shazam! is too long (by about 15 minutes) and there are a couple of subplots that don’t work but, on balance, it’s a fun experience. Sandberg excels at balancing the shifting tones; we never feel like we’re getting whiplash. The comic book/spectacle elements are throw-aways but the comedy is stronger than I expected. I laughed more during Shazam! than any other movie thus far this year (that’s not saying much, I know, when one considers how humor-deprived big-screen comedies have become). In the current superhero landscape, Shazam! isn’t expected to compete against the likes of Captain Marvel or Avengers: Endgame. But its status as a minor-league player doesn’t diminish its capacity to entertain (doing a better job at that than some of the higher-profile alternatives).